多少 钱? - How to bargain without being rude? I have a question about bargaining. 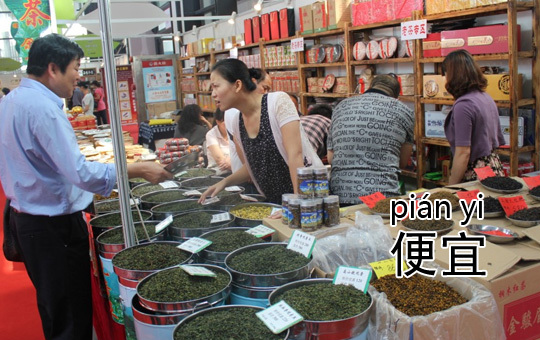 We learn 多少 钱 when asking for prices, and also 太贵了 for too expensive. But I suppose stating repeatedly “too expensive”, “no, this’ too expensive” could sound a bit rude, right? So here’s my question: how do I bargain for something without being rude? What kind of structure can I use to soften things a little and get better prices not because I sound scrooge and rude, but because of my bargaining skills. You haven’t mastered the Chinese art of bargaining if you are afraid of being rude. That’s why I let my Northern Chinese wife do all the bargaining. Best tip: simply offer a price no more than one quarter of what they’re asking (don’t be afraid to go to one tenth if they’re clearly asking way too much) then walk away when they make a counteroffer. They’ll often chase after you to do the deal on your terms. True, i am always afraid of bargaining but i assume it is part of the game. Bendobay, it seems that there are places we can not bargain; like big clothes shops, do you think it is really true ? 3, 姐姐呀, 漂亮的姐姐呀, 便宜点嘛. 我穷得快吃不起饭了. Hey @danielpioner, I found this lesson which hopefully covers some of the vocab that you are looking for. Bargaining is a part of life in China. If you want to pay a good price for something, you have to haggle a bit. In this lesson, learn the basics of bargaining in Chinese. In my personal experience, I was a bit uncomfortable bargaining for a price when I was first in Asia but was told by friends and family that bargaining is part of life in China and people find it something natural in their daily lives.